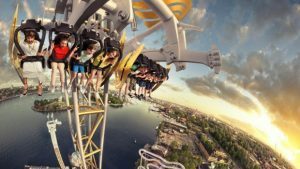 December 16, 2016 – The building permit for Ikaros, Gröna Lund’s new Intamin Sky Jump drop tower, has been denied. The Land and Environmental Court stated that the building application for the amusement park contained insufficient information about the impact of the new attraction on the environment. Two local residents filed the appeal on the grounds that the provincial government did not have sufficient data regarding the impact the sound of the new attraction would make on the environment and the court agreed in its judgment. The park is sticking to the ride’s planned opening date of April 2017 and stated they would appeal against the ruling while continuing construction of the attraction in anticipation of overturning the denial. Ikaros is a 312 foot (95m) tall tower, the seats of which lean forward 90° before the drop that allows riders to look downward during the free fall. Read more in our Forums discussion. This entry was posted in News and tagged Drop Tower, Gröna Lund, Ikaros, Intamin, Sky Jump, Stockholm, Sweden. Bookmark the permalink.